Is it possible to reach every single student in every single accounting program at every single U.S. school to tell them about careers in management accounting and IMA® (Institute of Management Accountants)? Probably not. But that’s a goal of IMA’s new Campus Influencers program, a pilot program launched in the United States earlier this year that’s already achieving impressive results. The idea for Campus Influencers began with Jimmie Smith, chair of the IMA Member Relations Committee and a long-time, committed volunteer leader. Over the past few years, Jimmie has conducted a number of informative presentations about IMA with college students in his home state of Texas. Jimmie has worked closely with Lisa Beaudoin, IMA’s director of educational partnerships, who has served on IMA’s business development team for the past nine years. Together, Jimmie and Lisa set out to find a way to let students know how IMA and its CMA® (Certified Management Accountant) certification can help support and strengthen their careers, as well as how both the organization and the certification can help with the transition from public to management accounting that some of these students very likely will make. 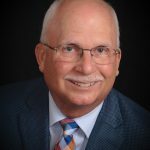 James C. “Jimmie” Smith is a long-time member of IMA, having served on the Global Board of Directors, as president of three IMA chapters and the Texas Regional Council, and, most recently, as the 2015-2016 chair of the IMA Member Relations Committee. Now retired, Jimmie spent the majority of his career working in Dallas in the chemical industry. He began his career in 1974 with Diamond Shamrock Chemical Company, which was acquired by Occidental Petroleum in 1986. 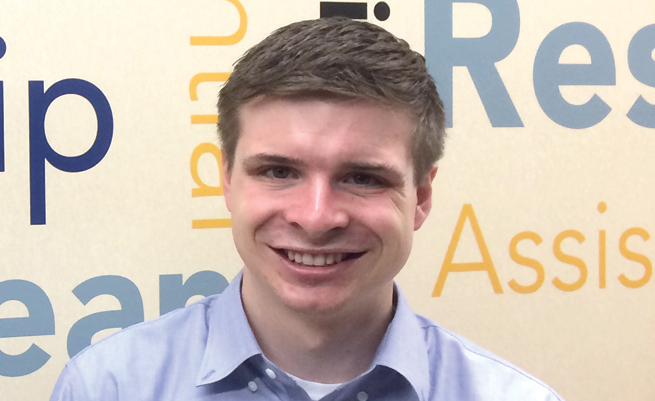 During his tenure, Jimmie worked in a variety of accounting and finance roles, concluding his career at Occidental in 2013 as senior manager of Sarbanes-Oxley compliance. Jimmie is a licensed CPA in Texas. 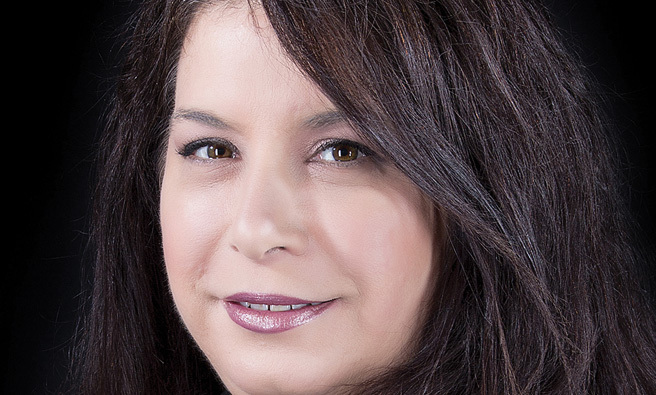 Lisa Beaudoin serves as IMA’s director of educational partnerships, working with companies and educational institutions to create awareness of the benefits of IMA membership as well as the benefits of earning the CMA credential. Lisa is a CMA and a CAE, and prior to joining IMA she was the Accounting Department chair at Cleary University in Ann Arbor, Mich. Earlier in her career, Lisa held various accounting and finance positions at Ford Motor Company, Ford Credit, and IBM Corporation. Over the past several years, Jimmie and Lisa—as well as a handful of other IMA staff members, chapter/council leaders, and volunteers—have made numerous presentations to students across the U.S. They’ve spoken on campus to accounting clubs, individual classes, and at special events organized by the schools and by IMA chapters and councils. They’ve reached a great many students this way. “Students’ eyes would light up when we explained all the opportunities available to them in management accounting,” Jimmie smiles. “Many of them hadn’t even considered that there were other options besides public accounting.” Given this success, the next obvious step became how to reach more students. But Jimmie and Lisa soon realized that, in order to make more presentations, they needed to develop a way to coordinate all these efforts and enlist the help of a larger network of volunteers. With the support of IMA senior leadership, including IMA President and CEO Jeff Thomson and the IMA Member Relations Committee, Jimmie and Lisa started spearheading a pilot program that would harness the network of IMA volunteers into a powerful group of Campus Influencers. The program provides volunteers with a “turnkey” approach, including a detailed, scripted presentation; supporting documents; and marketing materials. There’s also a defined step-by-step process for how to make contact with colleges and universities; how to keep IMA staff, the local chapter, and the council in the loop; and how to maintain the relationship over time. “We know that our members are busy professionals, so we created a program that includes content and resources that are thorough and easy to use,” Lisa notes. The pilot program launched last February with more than 40 volunteers. As word spread about the program, more members signed up to become Influencers, and there are now nearly 100 people on the team. Many serve as IMA leaders in their respective local area or region or have maintained a long-time affiliation with the association. But there’s room for more. Basically, the program requires two types of individuals. One is volunteers who can help identify and contact colleges, universities, accounting professors, and accounting department chairs. The other is individuals who are willing to make presentations to accounting classes and student clubs. People can even choose to fill both roles, Lisa adds. 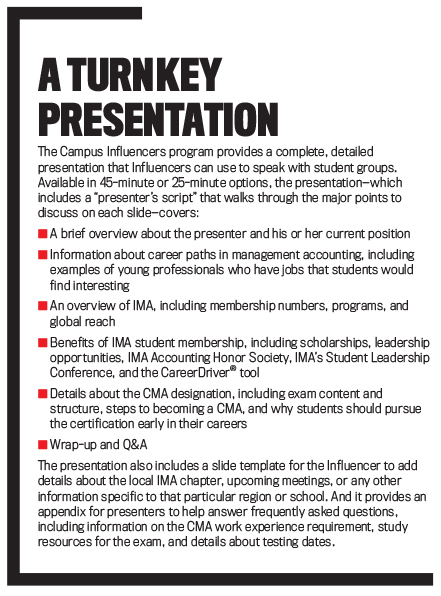 The first step when a member becomes a Campus Influencer is to identify potential academic institutions and individual educators who would be receptive to allowing someone to make a presentation about IMA and its offerings for students. Volunteers are tasked with identifying suitable schools, including local colleges or universities and schools where they have a personal or professional chapter connection. Internet research includes reading faculty biographies to find professors who teach managerial accounting, are CMAs, or are faculty advisors for student clubs. Making cold calls is part of the process, too. When evaluating potential schools to target, it’s good to find out if the school offers an accounting degree. If the answer is “yes,” then the next step is to dig deeper to find the appropriate person to reach out to. The process, of course, may require more than one phone call or e-mail—and it may take persistence and a little bit of luck. Once contact has been made and a date and time agreed on, the next step is to present. Fortunately, IMA makes it easy. Lisa has developed a 45-minute presentation along with a sample script that explains everything students need to know about IMA and what the association offers: benefits of membership, the CMA certification, information about accounting career paths, and more. 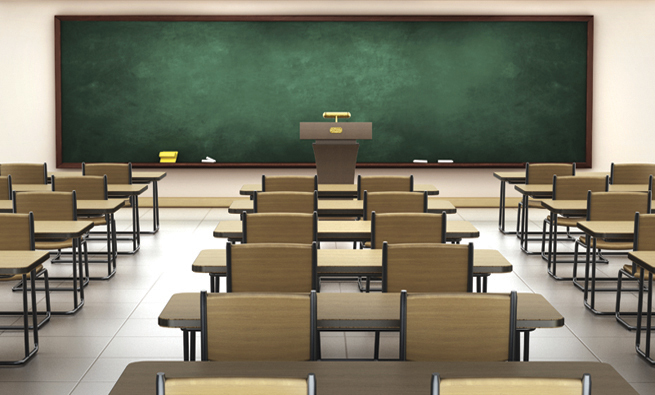 Lisa has used the same presentation—in a somewhat modified form—on many college campuses. 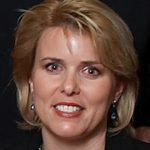 She developed it based on her experience within IMA as well as her previous roles as a CMA working in industry, a college instructor, and an accounting department chair—all of which helped give her insight into what employers want and what students need to do to prepare for their careers. A focal point of the presentation is a discussion about the various companies and organizations that need skilled management accountants. In fact, this portion of the presentation—which includes stories of individuals who hold accounting jobs in industries like consumer sporting goods, music and entertainment, and nonprofit—often generates the most feedback and positive response from students. The IMA team also offers an abbreviated, 25-minute version of the presentation (and accompanying script), which, although less preferable than the 45-minute version, gives a condensed explanation of the major points. Another option is to have the presentation conducted as a webinar. This is particularly suitable for schools in more remote areas where there’s no local IMA member living or working nearby. It’s also a good option for reaching students in online educational programs. Presenters also should consider inviting other IMA chapter or council members to attend, if possible. “The more people who come out to make the presentation, the more impressive it is for the students,” Jimmie says. 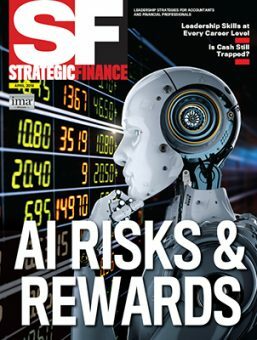 In addition, presenters are asked to bring a variety of written handouts and publications to distribute to students, including IMA and CMA brochures, copies of Strategic Finance, and information on student scholarships and programs. IMA provides all these materials, and volunteers work directly with Woré Giotta and Tara Barker, specially assigned IMA staff members who help coordinate the program. An important component of the program is following up with contacts. 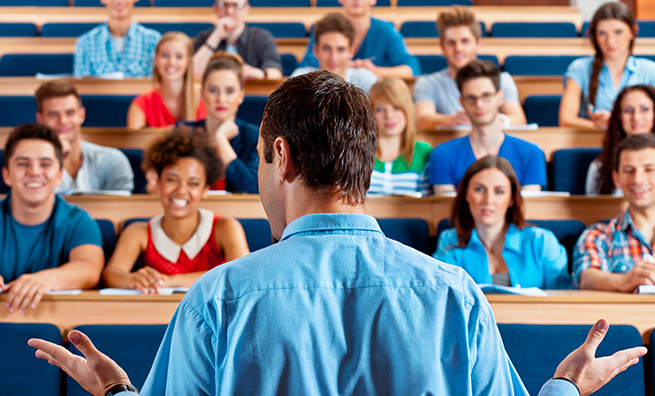 Contacts include the initial point of connection, who might not be an actual classroom teacher but rather a dean, administrator, advisor, or even a student, as well as the educator for whose class or organization the presentation was made. 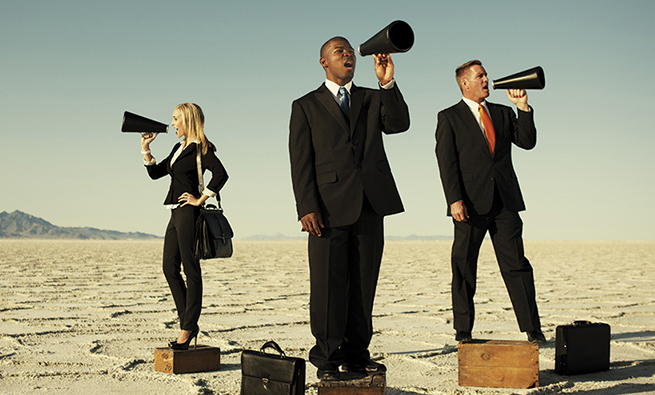 Influencers are advised to send a thank-you e-mail to these individuals afterward. Then it’s up to the Influencer to maintain the connection. 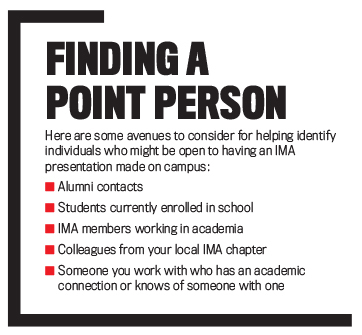 Volunteers can maintain contact with professors by keeping them informed about local IMA events. This could include sending an e-mail or calling to invite them personally to IMA-sponsored programs, seminars, conferences, and the like. It also could include offering to do presentations to students each semester or each year, depending on what makes sense for the program. After the presentation, Lisa follows up with the professors or other faculty members to discuss IMA’s many academic resources that can support faculty, students, and the school’s accounting program. 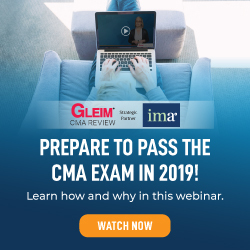 This includes information about the IMA Higher Education Endorsement Program, which recognizes business curricula that meet the quality educational standards required to enable students to prepare for the CMA certification. Receiving IMA’s endorsement shows that the school offers a high-quality program that provides students with the knowledge and skills that employers need. To help Campus Influencers navigate the specific path to serving in this new role, Lisa and Jimmie offer an hour-long training session via webinar. During this interactive group session, the two describe the program’s goals and specific details about how it works. They also walk through the 45-minute and 25-minute presentations so that volunteers see exactly what they’ll be discussing with the students and have an opportunity to ask any questions. Since the program was launched this past winter, Jimmie and Lisa have conducted two successful webinar training sessions with their cadre of Campus Influencers. 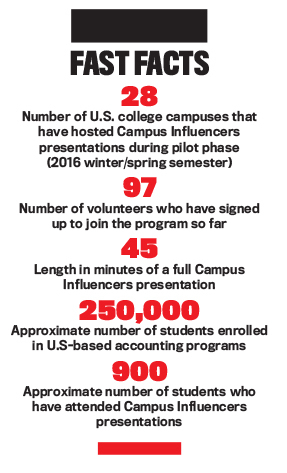 Following these sessions, Campus Influencers made presentations on 28 campuses in the U.S., reaching approximately 900 students in Connecticut, Florida, Massachusetts, Missouri, New Jersey, New York, Pennsylvania, and Texas. Many more presentations are scheduled for the fall 2016 semester as well. So far, feedback from attendees has been very positive, with many students expressing interest in joining IMA, taking the CMA exam, or gathering more information about the association and its resources. The pilot phase of the program will soon be over, and IMA is looking to develop a more long-term group of volunteers who are willing to serve. 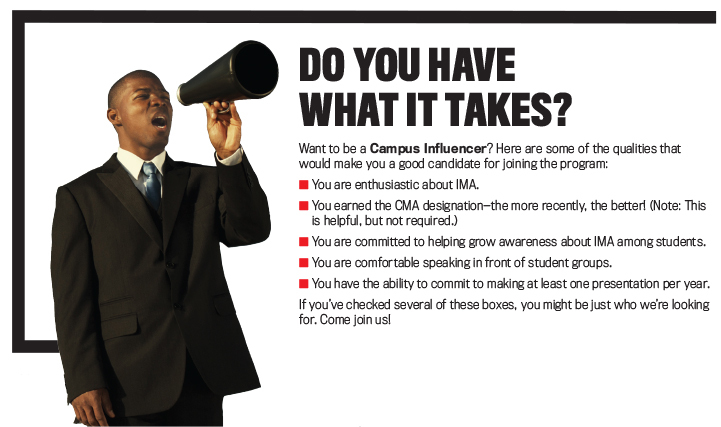 If you’re interested in becoming an IMA Campus Influencer, send an e-mail to campusinfluencers@imanet.org.